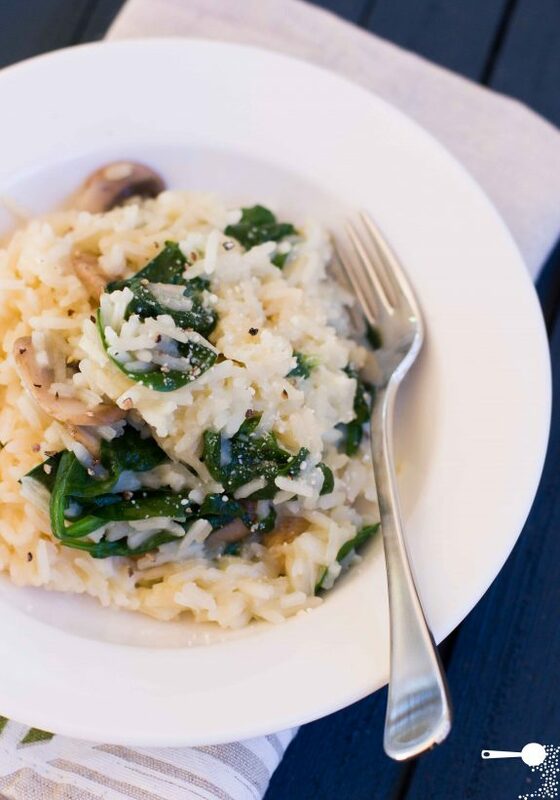 This Mushroom and Spinach Risotto is made with regular rice and really is a dish you can make your own AND in less than 30 minutes. I wasn’t going to cook this meal, because I picked up a couple of ready made organic chicken and leek risottos at the Good Food and Wine show last week. I had spent the weekend running around and the instant but additive-free meal sounded like a perfect option. However, plans changed when I opened the pantry and found that the risotto packets have expanded and were on the verge of blowing up and sending a splatter of risotto all over my wire rack pantry. I quickly discarded them and the idea of an instant meal, and went on to cook my own. But then of course, I didn’t have any chicken so it had to become a vegetarian version. To makes matters worse I also discovered that I was out of arborio rice – the traditional rice variety used in risotto making. Aw well. I had to improvise and used regular long grain rice instead. I prepared it in the exact same way as I would arborio. Within 10 minutes of beginning to cook, Mr Chipconnoisseur came into the kitchen, seduced by the wonderful aroma that began to fill the house… “Mmm… smells really good”, he said. And it did. I added the classic trimmings of butter, stock and mushrooms, complemented by bay leaves, a dash of white wine, baby spinach leaves and some Parmesan cheese. 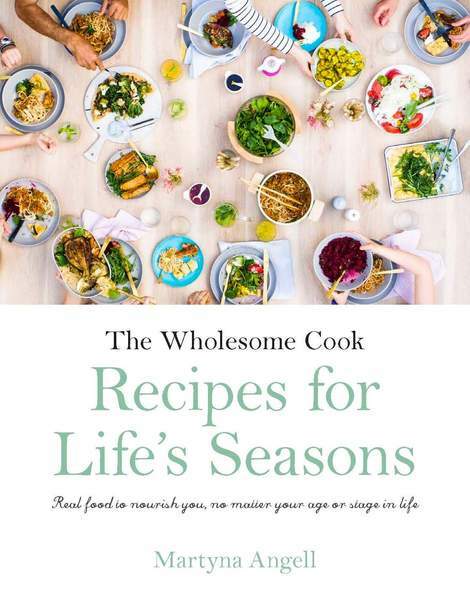 But feel free to make it your own and add the things you like, or happen to have on hand. I was even thinking that it go really well as a side to steak or grilled chicken! It really is a dish you can make your own: add (frozen mix of) carrots, peas, corn or roasted pumpkin, rocket, bacon. Anything really... and it's ready in less than 30 minutes. Omit the cheese and use margarine for a dairy-free and vegan version. Heat 1 tablespoon olive oil in a small fry pan over medium heat. Add sliced mushrooms and cook for 2 minutes, stirring, or until browned all over. Set aside. Place butter and 1 tablespoon olive oil in a medium saucepan. Heat over medium high heat until bubbling. Add rice and bay leaves and stir fry in the butter for about 1 minute. At this stage, add a quarter of the stock and bring to a boil. Cook for 4 minutes, stirring. Add half the remaining stock and bring up to a boil again. Reduce heat to a slow simmer and half cover the saucepan with a lid. Cook for a further 5 minutes, stirring from time to time. Add mushrooms and the rest of the stock and simmer down, covered with a lid for another 4 minutes or until all the stock has been absorbed and the rice is tender. Add Parmesan cheese and spinach leaves and mix well. Divide risotto between bowls and serve with extra Parmesan cheese and freshly ground black pepper. I really impressed that you were able to recreate a risotto with a different rice.. that opens up all sorts of possibilities because my pantry is usually stocked with “odds and ends” of different rices. Love. love. 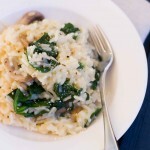 love risottos, but have only ever used the three different risotto rices – glad the LG worked! Actually I only cook vegetarian risottos, probably because both my risotto books are just that 🙂 ! Pumpkin, sweet potato and mushroom ones + ‘green bits in it’ are the favorites. But I use a lot more wine – do you know how good a glass of soft N Italian red is in it, both for looks and taste? Lovely post: thanks! I love risotto. I’ve found the best way for me to make it though is a bake in the oven version – otherwise I lose my mind…lost my oven recipe though. Great recipe! I love that not having aborio didn’t stop you making an awesome risotto. I will never let the rice in my cupboard stop my need for risotto again! I’m impressed with this ‘easier’ version of risotto – and also how easy it would be to change up. Your risotto looks creamy even though you used regular rice. I will have to keep that in mind next time I am out. Mushroom and risotto already sounds good and you added spinach. I must try this. So easy to make. Next time when we grill some steak and need rice, risotto it is. I actually can’t wait to try this one out. Not sure if my risotto will come out nicely like yours (mine always look not right…and I’ve been trying to get it right for some time). I have never made risotto. Maybe this will be my recipe into the club. look gorgeous! I am definately cooking this. This looks so delicious. And easy too. I’ve never made risotto but I might be able to handle this recipe!!! !